I don't know about you, but it's taken me quite a while to get into a proper routine of blogging. Over the last couple of years, I've gone through really intense periods of blogging, and then I'll have like a couple of months, or sometimes even longer, where I just don't blog! I think... let's hope so anyway, I've found a way to keep up a regular blog routine without making me feel overwhelmed, and a way that allows me to gradually incorporate new ideas into my posts. I thought I'd tell you what I do. So, back in January, when I decided, let's do this, I really wanted to blog 'properly'. I didn't want to be scrambling around frantically thinking up blog post ideas the day before I wanted to publish them, I wanted blogging to be chill. 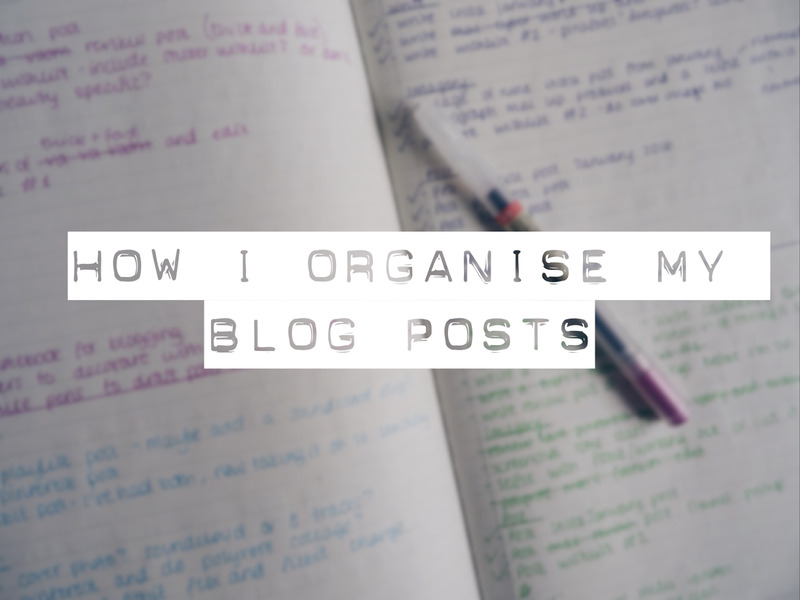 I wanted to see my post ideas, have a plan, and be able to get on with writing posts a bit in advance so that there was no, "Oh my god a blog post is due and I haven't written it". Obviously, there are no deadlines for me. If I don't post, the only person I have to answer to is myself. But I like the structure. If I can manage to blog three times a week, I feel like I can pat myself on the back and say well done, you've done something productive with your time. So, first things first, I went out and got myself a plain notebook from Muji (there stationary is to die for) and some new pretty coloured pens. If there's one thing that's going to motivate me to be organised, it's pretty coloured pens. In my notebook, I've come up with a four-week plan. I draw this up every four weeks, (I leave a double page between each one for any ideas that some to mind, extra to-do lists, and general doodling). 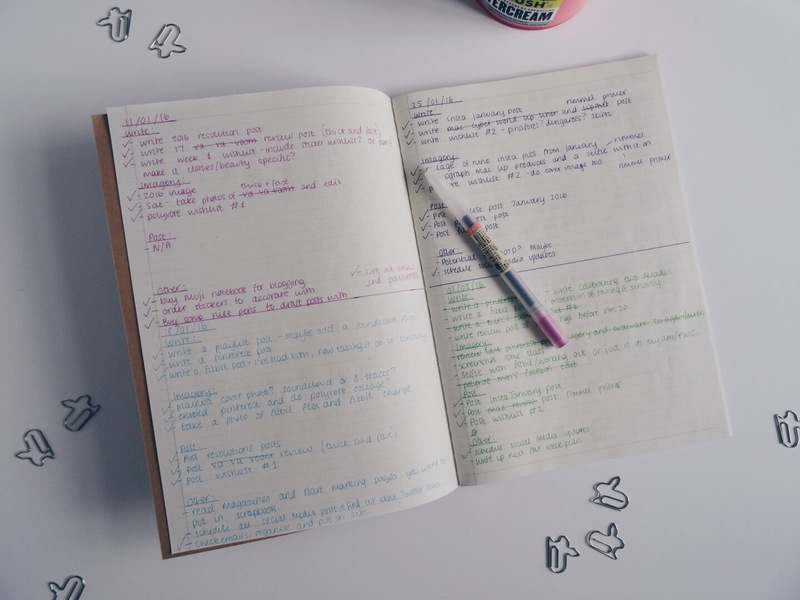 I then make notes for what blog posts I would like to write, ideally I try and write a week in advance, this doesn't always happen, but it helps me figure out what's coming up post wise. I write down what images I need to create, which blog posts are going live, and then any other notes, like scheduling tweets, replying and reading comments, reading other blogs. So far, I am loving structuring my ideas like this. I like planning out the next four weeks because you can see how different posts can lead up to one another. You can also make sure there's enough variety, and, it means you've got some time to think about posts before it comes to actually writing them. I don't get any more specific than the week, for example, I don't say, "On Monday night I will write post x, Tuesday post y, and Wednesday post z" because even if it's a week in advance, that's too much pressure. I just aim to write them at some point, around whatever is happening in my life that week. I think by not being too specific about when to get things done, you can't really get annoyed at yourself if you don't manage to write a post on a specific day. I take a batch of photos every Saturday, and honestly, unless I had this plan, I don't think I'd be able to, because I wouldn't know what's going on where, what I should be taking photos of, and what my highest priority is. If you only have a limited time to take photos and you need to do a big batch, I would definitely suggest planning the next few weeks of content. I think this pretty much covers how I organise my posts. Whenever I have a new idea, I jot it down, and then the next time I come to drawing up a four-week plan, I review last month's posts, see what went well, what I enjoyed, and see how I can fit my new posts in. It makes it fun! Plus, I like to use a different coloured pen for each week to jazz the whole process up a bit, and make my notebook extra snazzy. That's why I bought stickers too! This is the first time I've had a dedicated notebook for blogging, and macaroni cheese it has made all of the difference! Try it! I used to just use Evernote, which I still enjoy, but I tend to ignore notes the older they get. When you actually write it down, it's there, it's in front of you, and you can't ignore it.